Past the lights of Rensselaer. Past the quiet, empty dairy barns. Keep going and you’ll hit Vermont. You spot the out-of-towners immediately. They don’t accelerate into the hills. At the top their cars are barely going 30. Live in the land of tourism. It’s needed, everyone knows that. Take the outsiders with a “Yes Sir, no Mam” toothy customer service grin. You’re just apart of the amusing state attraction. Snow is a given. More than a given, so beating through it means coffee and cake. 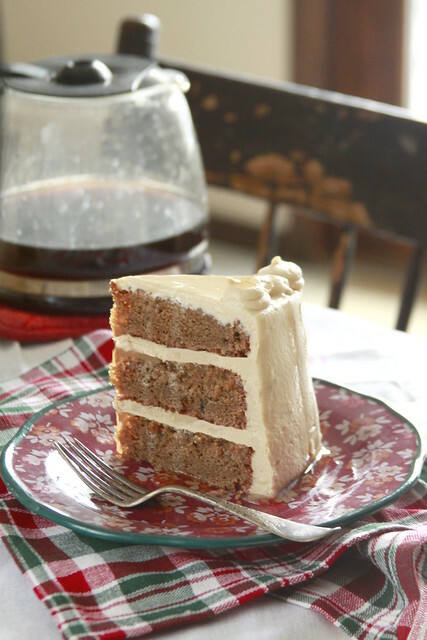 Vermont Coffee Maple Cake. 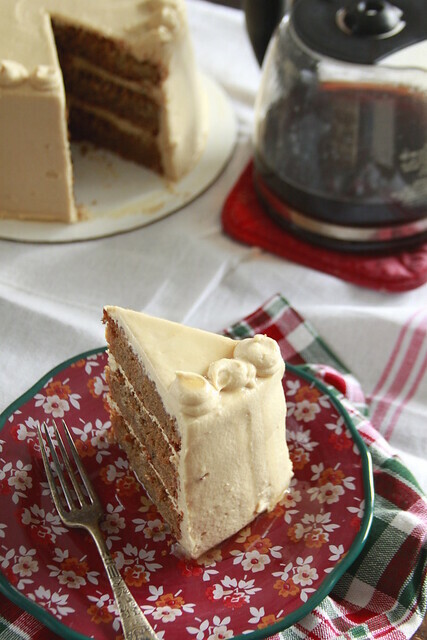 Direct injected coffee present cake, delicate maple frosting. True espresso powder is used instead of coffee powder. But the espresso powder carries the coffee flavor better and doesn’t weaken in the baking process. Maple morsel chips bake up as a subtle crunch against a pillowy soft cake and frosting. The taste of maple draws you in and the espresso keeps you there, grounded and rounding with a deep, roasted quality. It’s the thing you eat after splitting wood or excavating cars from snow. 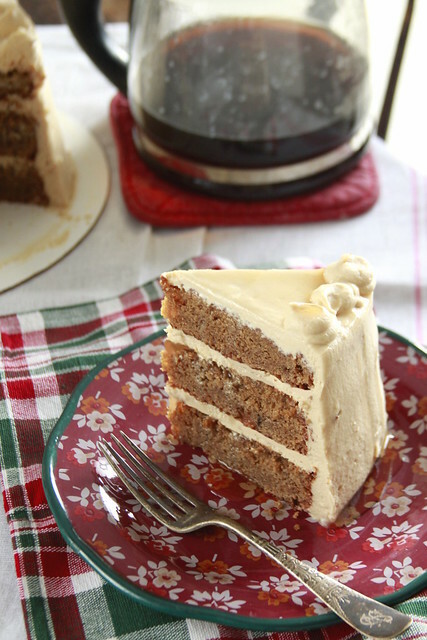 This Vermont Coffee Maple Cake will carry you through theses biting winter days. Preheat oven to 350 degrees F. Line 3 (8 inch) cake pans with baking spray. Cream butter, oil, and sugar in stand mixer fitted with a paddle attachment until light and fluffy on medium speed, about 2 to 3 minutes, scraping bowl and paddle as needed. In a small bowl combine sour cream, dissolved espresso powder, and vanilla. With mixer on low, add dry-ingredients in 3 additions alternately with wet-ingredients in 2 additions, beginning and ending with the dry-ingredients. Give batter a few stirs by hand with a rubber spatula to ensure engender incorporation. Fold in maple morsel chips. Divide batter evenly among prepared pans, baking for 20 to 24 minutes, rotating halfway. A toothpick inserted will come out mostly clean with a few moist, not wet, crumbs. Let cakes rest in pans for 5 minutes before inverting onto a wire rack to cool completely. In a stand mixer fitted with a paddle attachment, beat cream cheese and butter on medium speed until smooth and incorporated. Scrape frequently to prevent lumps. In a small bowl whisk dissolved espresso with maple syrup and vanilla. Lower speed, gradually add powdered sugar alternately with wet-ingredients. Scrape bowl and paddle as needed. Add salt. Once incorporated, raise speed to medium-high and best for 1 to 2 minutes. Dollop a bit of frosting onto a cake board secure first cake layer. Pipe frosting, using an offset spatula to even put layer. Repeat process with second layer. Top with final, third layer. Chill for 30 minutes. Apply a crumb coat. Chill for 15 minutes. Apply a thicker coat of frosting, smoothing with a bench scraper. Top cake with a border of frosting. Drizzle with warm maple syrup.